Tonight on the way home, I stopped at a local car dealership where a friend needed to have some work done on his car. The trip would have been made much sooner, but he had to wait several weeks for the part (some window weather stripping) to arrive. As we sat in the waiting room I began to wonder how we at Local Motors can avoid delays such as this once we have our first facility established. The first thing that came to mind was that the wait was most likely due to the fact that the large GM dealership simply can't stock every part for every car in the lineup at any given time. There are two reasons that come to mind why this should be easily avoidable at Local Motors. 1) We may have several models in due time, but nowhere near the degree of larger auto manufacturers. Also, the designs will be simple, and many parts will be used on multiple platforms. 2) We (each Local Motors location) will be the dealer AND the manufacturing facility under one roof, so we should always have any and all parts in stock. If we don't, both service AND production could come to a halt. Maybe this is a bold line to draw in the sand this early, but it makes sense and is a pretty simple concept. That sensible simplicity is just what will allow us to offer a game changing customer experience far unlike that achieved by any of the larger auto manufacturers. 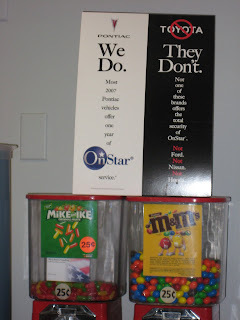 If you can't read the fine print, it says that MOST 2007 Pontiac vehicles come with one free year of OnStar®. They could be doing so much more to improve the customer's experience. As I mentioned in a few previous posts, sustainability is what is going to drive auto manufacturing in the years to come. Also mentioned was the success of such designs and how we need to speak to people's hearts as we design new vehicles and mobility systems. One example of the "nostalgia" aspect I mentioned previously is the creation of the 2008 Morgan LifeCar. This is clearly a design based on an elegant, classy car from the past with a modern twist on the styling, not to mention the technology involved - it's a hybrid powered zero-emission vehicle. "The LifeCar’s purpose is to demonstrate that a zero emission vehicle can also be fun to drive. The combination of performance, range and fuel economy will allow a sporting driver of the future to demonstrate a concern for the environment." Pairing that statement (from the Morgan website) with the styling of the car, I'd much rather be apt to purchase this vehicle over last night's entry, the sQuba. Again, this car connects with the fact that a car is meant to be driven, and when it performs well, that speaks to my heart far more than the ability to submerge the car. Therfore, I think this design is one that could be very sustainable...now we just have to wait to see how much it will cost to make the final call! About five years ago as my friends and I were about to graduate college, one of my friends decided not to enter the WORK force after all of our hard work to earn degrees as Mechanical Engineers, but to enlist in the ARMED force[s]. About a week after graduation, he was on his way to boot camp. Since then, I've gone from seeing him every day to maybe three or four times in the last five years. If you possess boundless ideas and creativity and you always think of new ways to organize and strategize, the Army wants to talk. Warfare today has new rules and calls for a different type of Soldier's new warrior. You need to be mentally superior and creative, highly trained and physically tough. Alone and part of a team, you'll work in diverse conditions, act as a diplomat, get the job done in hostile situations and, at times, establish residence in a foreign country for months. These Soldiers are part of the Army's Special Forces (SF)'the Army's most specialized experts in Unconventional Warfare. Serving in or with the military of the United States after 6 December 1941, distinguished him- or herself by heroic or meritorious achievement or service, not involving participation in aerial flight, while engaged in an action against an enemy of the United States; while engaged in military operations involving conflict with an opposing foreign force; or while serving with friendly foreign forces engaged in an armed conflict against an opposing armed force in which the United States is not a belligerent party. He'll be upset that I called attention to this since he's a modest guy, and to put it as the day he told me about it, it was, "Just another day on the job." He's in town this weekend, so I'm heading out to buy him a few rounds as the most minimal of ways to say "Thank you" so I'm going to have to end my post tonight here by saying "Thanks and Congratulations" to my good friend and to encourage everyone reading this to remember our friends, family members, and the Service men or women you see in uniform at the airport whom you don't even know by simply thanking them for the sacrifices they make every day as we enjoy our everyday freedoms here at home to let them know we love them and appreciate their valor in simply enlisting, Bronze Star or no Bronze star. 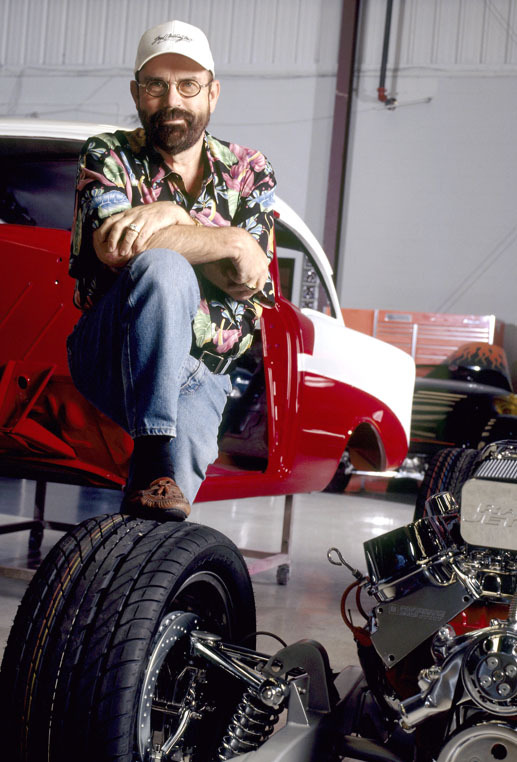 Having said that, I will continue to keep the ball rolling by giving a special thanks to our own Jay Rogers for his service in the Marine Corps prior to making another bold decision to start his own company we now call Local Motors. If you don't have someone in mind to send that thanks to, drop Jay an email. The Summit at the Art Center reinforced our belief that maintaining simplicity and flexibility as core competencies will be what allows us to implement new, sustainable designs with the most success. This was evident in the admonition made by Paul Hawken (author of the ground-breaking books Blessed Unrest, Ecology of Commerce and Natural Capitalism) to executives at one of "The Big Three" after viewing the newest concept cars they had to offer. After being told that the concepts that had the most "bells and whistles", the largest passenger capacity etc. would be the cars of the future and not the simpler, more utilitarian concepts they were working on, Paul stated that they had it backwards and that the car of the future is the one that was the most simple of the vehicles in that it would be capable of meeting the demands of the user, and also be flexible during the changes in cities, systems and mobility to come in the near future. If you keep the design simple (yet still effective in its intended use) you also maintain its flexibility to adapt to the users needs as they change over time. Understandably, uncertainty is the biggest roadblock to sustainability. Therefore, flexibility is the key to sustainable design. By keeping your design simple, you allow yourself, or the consumer in some cases to "re-invent" it as time progresses and needs change with little interruption on the core design and the energy used to manufacture those core aspects of the vehicle. We plan to make this possible by providing the core capabilities of what the vehicle(s) we produce will need to perform their main function at a class leading level, while maintaining flexibility by allowing the consumer to customize and repair as needed over time while reusing the core components. I was in the barbershop today flipping through a recent issue of Stuff Magazine while I was waiting, and came upon a piece they did on “How to Dominate the Competition Before Age 30.” Being 28, and in a position to affect change in the auto industry, I took special interest in this column just by reading the title. In the article, they gave a ranking of well-known men in such professions as music, athletics, acting, and business. For a car to be really successful at any price point (particularly 40-50k+ range), the “I have to have it!” factor must be present. Change the game with your product design, method of manufacturing, and the way you conduct business with such impact that other manufacturers in the market can’t function at your level without modeling the practices after those which you engendered.